We have already discussed the generation of single photons by nanoantennas at high rates before. However, single-photon generation is a statistical process and for industrial applications it is often needed that the generation of single photons is known up to a timeframe of a few nanoseconds only. Here we present a solution to this drawback: triggered single-photon generation. We use a hybrid plasmonic device consisting of a lambda-type quantum emitter and a nanoantenna and develop a descriptive theory for it. In this theory, the dynamics of the hybrid system is mathematically hugely simplified. It can be used to design real-world devices. As a proof-of-principle, an examplary design is shown to adhere to the demanding requirements of triggered single-photon sources with extremely high output from a nanoscopic volume. Information technology requires the conversion of optical signals from one energy to another. We present a way how this can be achieved using state-of-the-art nanotechnology. 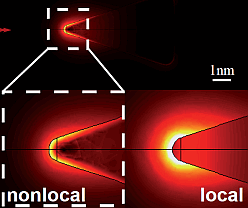 Slightly asymmetric optical nanoantennas exhibit different modes with a certain spatial overlap. With the help of a quantum emitter, the coupling between these modes can be efficiently mediated. The quantum emitter thereby acts as an energy shifter due to its internal level structure: It takes energy out of a high-energy mode, converts it to slightly less energy which in turn excites another mode of the nanoantenna. Because of the increased coupling between the nanoantenna modes and the quantum dot ones, this process is extremely fast and very efficient. Our approach is therefore suitable for fast and efficient next generation signal conversion. Closely spaced nanoparticles like dimers allow the localization of electromagnetic fields to tiny volumes. When quantum emitters, such as dyes, are placed in the gap of those dimers, their absorption and emission characteristics can be modified. Both processes have to be considered when aiming to enhance the fluorescence from the quantum emitters. This is particularly challenging for dimers, since the electromagnetic properties and the enhanced fluorescence sensitively depend on the distance between the nanoparticles. Here, we use a layer-by-layer method to precisely control the distances in such systems. We consider a dye layer deposited on top of an array of gold nanoparticles or integrated into a central position of a double array of gold nanoparticles. 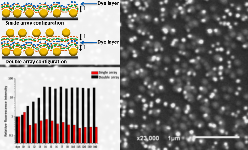 We find a maximum of a 99-fold increase in the fluorescence intensity of the dye layer sandwiched between two gold nanoparticle arrays. Our work paves the way for large-scale, high throughput, and low-cost self-assembled functionalized plasmonic systems that can be used as efficient light sources. The observation of Fano resonances usually requires nanostructures with multiple plasmonic resonances like higher order multipole moments. We show that similar spectral features can be observed with nanoantennas exhibiting solely electric dipolar resonances. The considered nanoantennas consist of multiple concentric gold nanorings separated by nanometric dielectric spacers. These nanoantennas exhibit multiple resonances in the visible and near-infrared. We theoretically and experimentally investigate how interference of these resonances cause Fano features and scattering dark states. Because of the electric dipolar character we employ a simplifed dense-array theory to predict the response of arrays of such nanoantennas from the electric polarizability of the individual constituents with a remarkable agreement to experimental results. A nanoantenna with balanced electric and magnetic dipole moments, known as the first Kerker condition, exhibits a directive radiation pattern with zero backscattering. 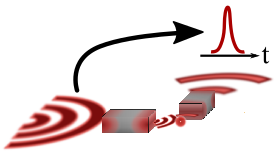 In principle, a nanoantenna can provide significantly enhanced directionality if higher order moments are properly balanced. 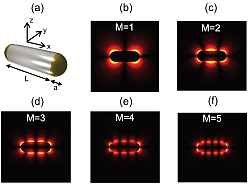 We study a generalized Kerker condition in the example of a nanoring nanoantenna supporting electric dipole and electric quadrupole moments. Nanoring antennas are well suited since both multipole moments can be almost independently tuned to meet the generalized Kerker condition. The possibilities of nanoantennas for an enhanced interaction of light with quantum systems is theoretically investigated. A versatile framework is introduced to describe this interaction: A classical electrodynamics description of nanoantennas enables to freely design and tune them for specific means. But this approach leads to a semiclassical description of the entire system. We further introduce a quantization scheme for nanoantennas based on their quasinormal modes, which enables a fully quantum treatment of the hybrid system. With this theoretical framework at hand, different effects in the vicinity of nanoantennas such as enhancement of dipole-forbidden transition rates, spontaneous emission and strong coupling are studied. A thorough appendix with all necessary derivations is provided. The local Drude model is a decent approximation for the response of metal particles to electromagnetic radiation. But for very small particles, this theory fails to predict resonance frequencies and field enhancements. In this publication we investigate how nonlocal effects due to the mutual interaction of conduction electrons can drastically alter the achievable spontaneous emission rate of truly three-dimensional nanoparticles. One of the main goals of plasmonics is to derive real-world applications from interesting research ideas. To achieve this, a largely tunable platform is needed that allows cost-effective, fast and large-scale fabrication. Nanorings are such a platform granting a large range of geometric parameters including ultra-small gaps and high aspect ratios. Our introduced fabrication method provides a decent platform for real-world plasmonic devices. When nanoantennas are coupled to quantum dots, the combined system may be used to emit single photons at extremely high rates. The quantum dot as a fermionic system provides single photons and the nanoantenna may enhance its emission by orders of magnitude due to the Purcell effect. All this can be understood withing classical electrodynamics has been known for some time now. Yet, a fully quantum treatment of the problem was missing to date. In such an approach to the nanoantenna-quantum-dot-coupling we derive an analytical expression for the emitted photon rate with respect to the incoherent pumping rate of the quantum dot. We find that indeed the Purcell factor is an important figure of merit but we also find a trade-off of it with the nonclassicality of the emitted photon rate. This result is quite surprising and will change how we think of ultra-fast single photon sources in general. If a nanonatenna is placed very closely to a quantum system, the so-called strong coupling regime can be reached. In this region, the properties of the nanoantenna and the quantum system have to be understood as a combined system that shows rich dynamics. One of the mayor features of such a system which may only be understood using a rigorous quantum description, is the emergence of strong energy shifts and entirely new energy levels. This leads to the possiblity to taylor the properties of the combined quantum system by design - the birth of "artificial atoms". Sub-wavelength light concentration by means of plasmonic nanoantennas is known to significantly enhance the nonlinear response. In nonlinear schemes involving multiple frequencies, however, it remains challenging to design nanoantennas that respond resonantly to more than one or eventually to all interacting frequencies. Considering plasmonic nanowire antennas, we hereby demonstrate the potential to engineer their resonances at more than one frequencies involved in the nonlinear process by carefully tailoring the antenna terminations. Although we consider here the degenerate nonlinear process of second harmonic generation, our approach can easily be extended to other nonlinear processes. Graphene nanoantennas can be used to strongly enhance the emission rate of quantum systems at specific frequencies in the THz frequency band. Furthermore, the electric properties of graphene can be tuned using the electric field effect. We can employ the tunability of graphene antennas to selectively enhance individual spectral features. The selective enhancement can be extremely useful for spectroscopy - we show for example how any weak transition in the spectrum of coronene can become the dominant contribution. In the present of a nanoantenna, the local fields probed by a quantum system can be dramatically different from those of a plane wave. 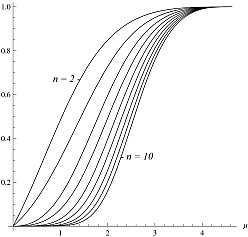 This can lead to the effect that "forbidden transitions" are enhanced by several orders of magnitude. Such an excitation leads to re-emission of light, e.g. by luminescence. However, in the presence of the nanoantenna, also this process is hugely affected. In the paper we show how to control the overall process using a certain nanoantenna and that such a fully self-consistent treatment is necessary to understand any physical observable. Characteristic length scales of antennas are those of the wavelength at which they operate. For visible light, highly sophisticated methods are needed to produce such devices, which could be achieved just recently. Aside from the technical problems in fabrication, there are a lot of open questions how to theoretically treat optical antennas since metal at optical frequencies is not a perfect conductor anymore. Here, the light-matter interaction has to be understood in terms of surface plasmon polaritons, a quasiparticle formed from collective electron oscillations coupled to an electromagnetic field. In this work, a theory is presented to describe the physical properties of circular optical nanoantennas made of an arbitrary stack of discs. The theory reproduces known results for simplified geometries and agrees very well with simulations. There are two main concepts to describe a resonant coupling of a nanoparticle to an external light field. 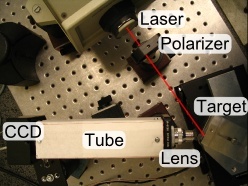 One concept refers to eigenmodes, which has been termed Localized Surface Plasmon Polariton (LSPP). 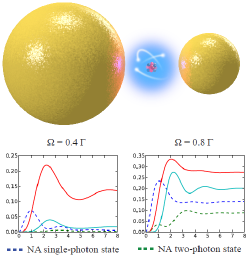 The other approach is to describe a dynamical situation in the sense of a Fabry-Perot resonator - a Propagating SPP (PSPP) gets reflected at the termination of a nanoparticle which is resonantly excited if the phase accumulated upon propagation and reflection adds up to multiples of π. The given work relates these two approaches and shows, how resonance frequencies for arbitrarily shaped nanoparticles can be calculated and how the characteristics of an object can be tuned by varying its termination. How precise can a shift of some plane interface be measured? A speckle pattern is a tiny feature of the reflected field from a rough surface under coherent light illumination. Since this field is depending on the surface variation, it has statistical properties resulting in a highly varying unique fingerprint of a specific area. Thus, even small movements of such a surface can be observed. By comparing images of different surfaces using the cross-correlation, one can compute the displacement if the images are not taken too far apart. Linewisely performing this procedure results in several measurements, which can be analysed statistically and significantly lowers the overall error. Introducing this concept, we show how a 10nm precision on a 50µm range is achieved. Black holes are fascinating objects. All the mass seems to be concentrated in one point and once crossing the event horizon, anything is condemned to be added to the singularity. Thus, black holes can be regarded as somehow extreme. The paper stresses the question, if there can be physically meaningful spacetimes as extreme as that of rotating black holes culminating in the Generalized Quadrupole-Conjecture. The publication sumarizes the main results of my diploma thesis Multipolmomente axialsymmetrisch stationärer Raumzeiten und die Quadrupol-Vermutung which tackles the introduction of multipole moments to general relativity in detail. Whereas the radiative core of the sun rotates uniformly, matter in the convection zone has a complicated velocity profile obeying differential rotation. In between is the tachocline, a thin layer, where a transition between these two zones takes place. Because of the fastly changing velocity profile, strong magnetic fields arise. Performing stability analysis, the work tackles the question on the maximal strength of magnetic fields in this region, which is crucial to understand the characteristics of sunspots and thus solar activity. Please note that the following text is solely to be a little better visible for search engines. It does not constitute a very well put-together overview of my research or any related topic, i.e. nanoantennas, quantum systems, plasmonics etc. It is merely some more or less elaborate text to be able to put these words a little more often into the text. Depending on the density of certain words, the articles on a certain homepage get evaluated statistically. This leads to a ranking if an article is relevant to a topic or not. So, if a word appears quite frequently in the text, the machine visitor will think the text is highly relevant. And of course, what is written on this page is highly relevant for research topics relating optical antennas, i.e. nanoantennas and their action on quantum systems. But let us give this little text a little more information. In an article on physics.stackexchange, a question and answer website about (very) general physics, a question came up if nanoantennas can be used for visible wavelengths and if such antennas can be produced by the layman. Obviously, also looking at the papers and little descriptions outlined on this page, the story is really quite simple. First of all, nanoantennas can be used at optical frequencies, but their size is much smaller than that of antennas in the radio frequencies. The reason is that metals at optical frequencies are not perfect any more. They allow the electromagnetic fields to penetrate the body of the antenna to roughly a few nanometers. This behaviour is often referred to as the skin effect. But because of their size requirement, it is clear that, secondly, a layman will have huge problems to produce deterministic antennas working in the optical frequency range: such devices are usually in the order of a few tens to a few hundreds of nanometers long. The field of research kicked off with a Nature by Mühlschlegel et al. in 2005. Of course, devices to harvest visible light on the nanoscale were suggested theoretically before. Nevertheless, the demonstration of a working (!) nanoantenna has proven the principle. A work by Novotny later has shown the enhancement of spontaneous emission rates of quantum emitters in the vicinity of nanoantennae. This so-called Purcell effect (actually not really a good name here) has given rise to speculations of highly emissive single photon sources, a topic we have also discussed deeply. In the end I sincerely hope you did not get bored reading this footer text not really suited for the interested human reader. If you have any questions, comments, raves or just feel offended by something on this website or physics in general, please do not hesitate to contact me on this website. Or even better, check out photonics101.com, the follow-up to problems in electrodynamics and discuss your concerns there. I would be delighted! author: Robert Filter, a fan of science, especially photonics. This last sentence is for google+. Now you should see my face next to the search result, yeah!